Last week I was contacted by Laura McMullen, a reporter for the U.S. News and World Report , who wanted to interview me the following day about tips I had for teachers to finish the year strong. She explained that she had searched for “high school teachers” on Twitter and my account popped up. She checked out my tweets and blog (a teachable moments for my students) and decided I would be perfect for the article she was writing. 1. Make a list of goals/objectives you wish to have students meet before the end of the year, prioritize them, and post in the classroom. 2. Chunk larger assignments into smaller sections; each section having due dates. This helps with procrastination and students waiting until the last minute to finish work. 3. End of the year is a great time to invite in speakers relevant to content studying into your classroom, either physically or virtually. 4. Give students choice. How do they want to demonstrate their learning? 5. Take advantage of the nice weather – reading, writing, geocaching, science experiments. Can your classroom be mobile and outdoors? 6. Provide an audience for your students projects, writing, etc. other than yourself. 7. Remain consistent with the routines and rules established at the beginning of the year. 8. Collaborate – get your class connected with students who are studying the same thing. 9. Reflect on the year and invite students to do the same; collecting responses to what they have learned, skills they have gained, least favorite and most favorite activities. 10. Spiral review- Connect prior learning from throughout the year with what you are doing currently and have students predict what they will learn about to the end of the year. 11. Don’t fight distractions, feed them. Tie lesson plans into summer plans. Have a student taking a trip? Talk about the places they will go or have them plan the ultimate summer vacation. 12. Get students active. Plan a service project for your community in which students can give back to their community. 13. Talk about the future. Have students give input about the year and the course of study they have been engaged in. Ask them for advice about what and how should be taught to incoming students. 14. Create a classroom survival guide. When students are reflecting on the course, have them create a short survival guide for next year’s students on what they can expect from the course. Please add your list of tips below! Lately there has been a buzz in education about gaming as an aid to learning. While many educators are unsure of applicable roles in curriculum areas, students have definite ideas of how they can use gaming, more specifically Minecraft, to demonstrate their learning. Working in a 1:1 environment has given students opportunities to create remarkable multimedia projects, and being a seasoned 1:1 school, students at BCLUW tailor their learning and projects to fit their areas of interests and passions. Meet Jarrett – a sophomore at BCLUW. As a freshmen he would amaze me with his stop-animation videos. He has a love of video games, like the normal 15 year old, and a passion to create. 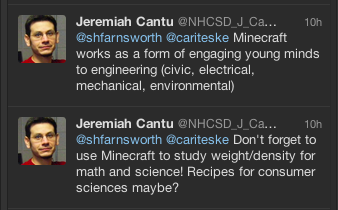 I knew Jarrett has used Minecraft in a few of his classes, History and English. 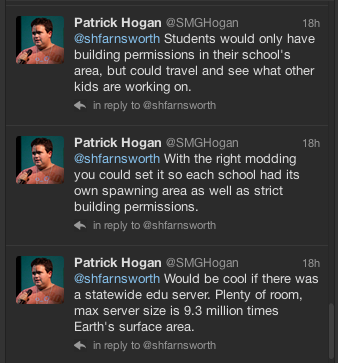 Likewise, students at BCLUW have used Minecraft in many other curricular areas. So what is Minecraft? Simply put, Minecraft is a virtual world where people build, explore, engage in battle. This survivor game is one where players use the environment to sustain life. Although that is the main focus of the game, gamers have been finding several new uses for Minecraft: architecture, computer programming, a hobby, and of course for EDUCATION. Here is an example of Jarrett’s work. It is a virtual tour of Egypt that he researched, designed, built, and PRESENTED. This project was one he proposed to his history teacher in place of the other assignment. Here are additional examples educators have been sharing with me. Please add your ideas in the comment section or tweet me!